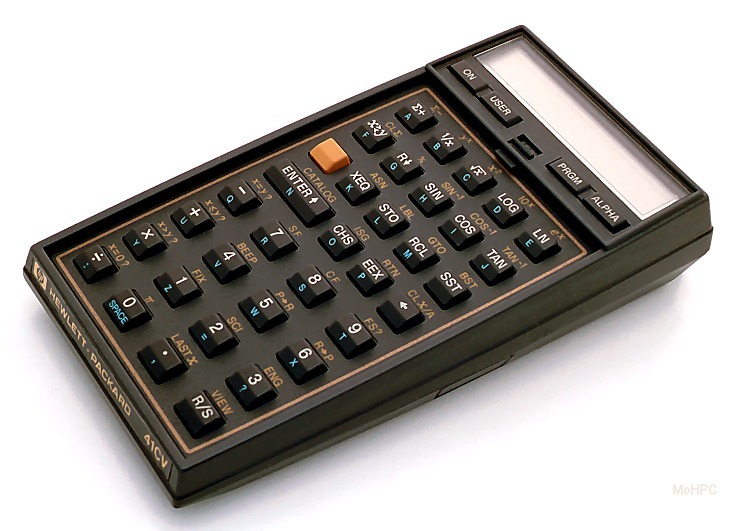 Around the time of the HP-67, an article in the Hewlett-Packard Journal, stated that electronic technology was no longer the only limitation of pocket calculator progress. The human interface was becoming an even greater barrier to adding more functionality. The HP-67 was an excellent example of the problem. It had three shift keys and most of its other keys had four functions. HP was running out of keyboard space for new functions, and many users found it difficult write and use numeric-only programs. Because typing out the name of a function could be cumbersome, the HP-41C added another toggle key called "user". The user could assign any built-in function or user program to any key. Once the keyboard was placed in user mode, any assignments made by the user overrode the label on the key. (With the gold shift key, this allowed two user functions per key.) The user toggle state remained set even when the calculator was turned off allowing true keyboard customization. To make it easy to remember keyboard assignments, HP provided keyboard overlays along with preprinted labels for all built-in functions and blank labels for user functions. In addition, whenever a key was held down, its function name was displayed. If it was the wrong key, the user could continue to hold it until the display showed "NULL" when meant the function was canceled. Of course, HP didn't just improve the human interface. The HP-41C had more memory (now non-volatile) than its predecessor, more functions, improved programming, and could be expanded with both RAM and ROM modules. 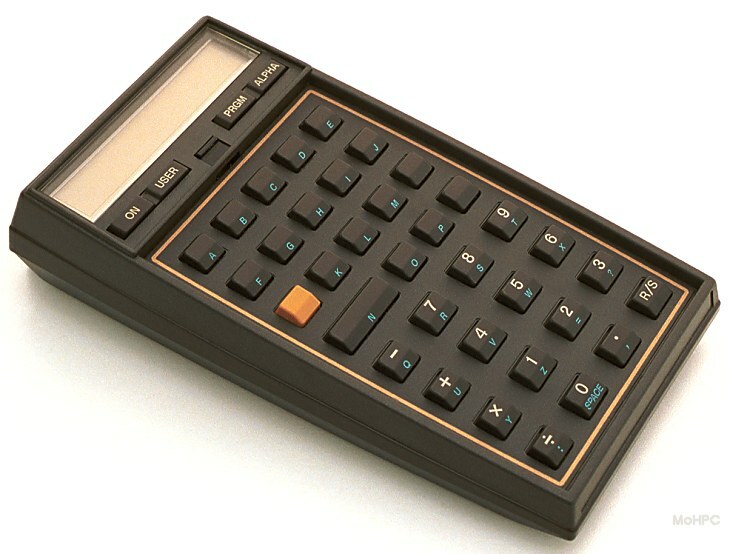 "The HP-41C represents a totally new concept in the design of Hewlett-Packard calculators. In fact, because of the advanced capabilities of the HP-41C, it can even be called a personal computing system. 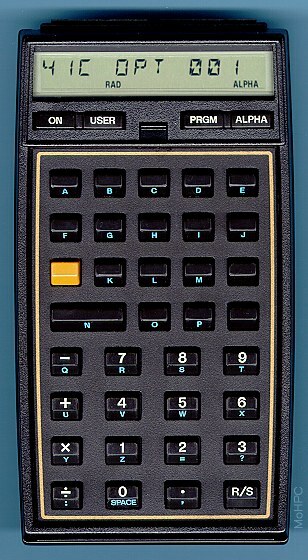 The HP-41C is the first Hewlett-Packard handheld calculator offering an exciting array of alphanumeric capabilities. With so many different kinds of calculator uses and applications in the world, we at Hewlett-Packard decided we could provide a significant contribution by designing and building you a quality calculator with expandable and flexible capability. The alphanumeric HP-41C is just the calculator." 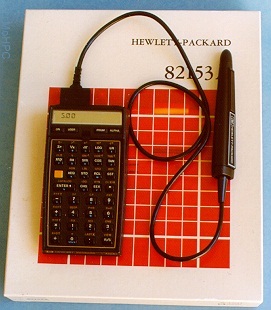 The HP-41C used a low power LCD display with 7 more segments than previous calculators. This allowed a full range of alphabetic characters. The characters were not as fully formed as a dot matrix display, but they had better contrast. 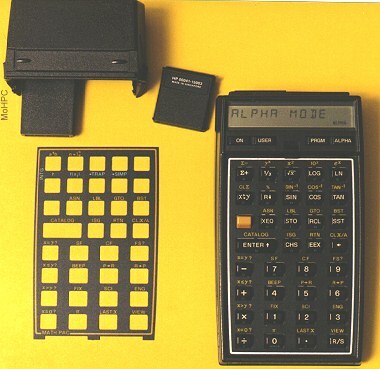 There was a special register on the HP-41C called the Alpha Register. It allowed up to 24 characters. This register was separate from the stack and the other storage registers. Alpha strings could be stored in normal registers or the stack but they were truncated to 6 characters when this was done. A function that shifted strings by 6 characters was included to make it easy to store long strings in multiple registers. Four ports at the top end of the machine allowed the user to plug in 4 more RAM modules which would increase the maximum register space to 319 or allow 1000-2000 lines of program space. (Or any compromise between those.) 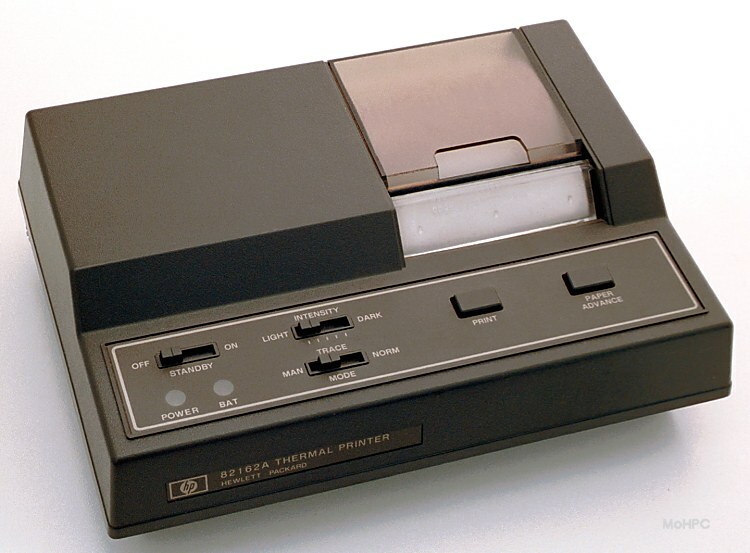 Later, the entire register space could be provided via a single "Quad Memory" module and Extended Memory was added to allow even more space..
Because the HP-41C had continuous memory and because its application pacs came on ROM modules, a card reader was omitted. However, one could be plugged into the top end. (In less time then it takes to read this sentence.) 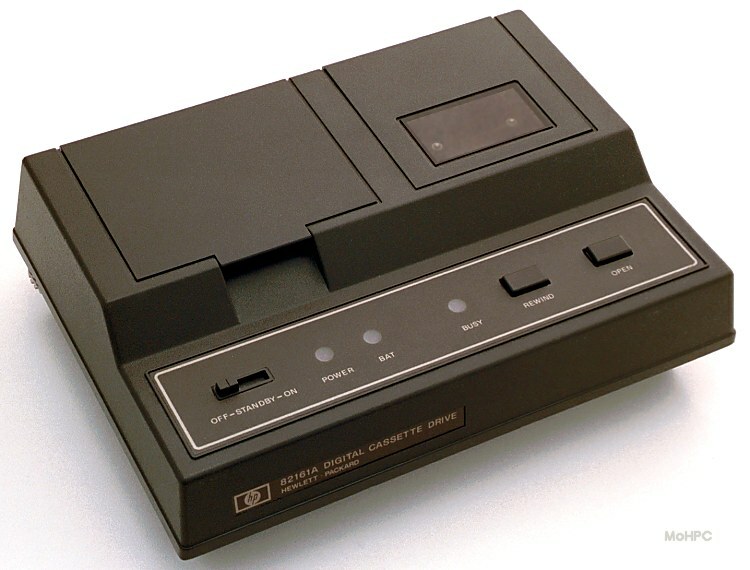 The HP-41C was obviously not code compatible HP-67, however, a sophisticated translator was built into the card reader which translated programs to HP-41C code on the fly. Geometry Heating, Ventilating & Air Cond. Alphanumerics brought new programming capabilities. Programs could have descriptive names, could prompt the user for input, and could label output. Prompting and labeling were done by building the desired string in the alpha register and displaying it. Strings, like numbers could be compared. 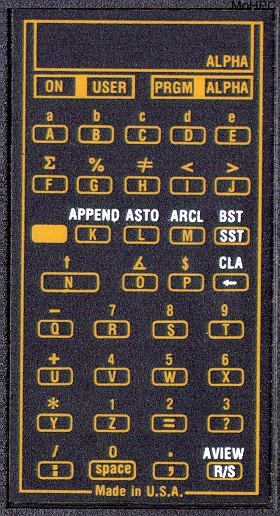 Possibly the greatest programming advantage to an alphanumeric calculator was that the programs displayed as readable commands rather than numeric keycodes. In the HP-41C, the programs were edited in their own spaces with local line numbers and local labels for branches and subroutines. Programs could also make calls or branches to global labels (i.e. other programs.) An individual program could be deleted with a single command. All built-in functions, ROM add-in functions, and user programs were listed in catalogs. (There was one catalog for each of the three categories mentioned.) The calculator could display each catalog in rapid succession, or the user could stop at any point in the listing and move backwards and forwards one entry at a time. No discussion of the HP-41C would be complete without a discussion of synthetic programming. The HP-41C had RPN instruction sequences of one to three (or more) bytes. Some of the possible codes were not documented and couldn't be entered from the keyboard but some clever users found ways around these limitations. Writing programs using these codes was called Synthetic Programming. A variety of programs were written to support synthetic programming. To use the simplest, the user exploited a bug in the HP-41C to enter a small program that extracted the next byte in memory from the instruction that followed. (The extracted byte could then be deleted as a separate instruction.) The HP-41C would then interpret the next byte of the instruction as the first byte of some other instruction. The instruction(s) that followed might be interpreted as part of a multi-byte sequence. Obviously, programming in this way, took some forethought and care. Faster and/or smaller programs. For example, looping could be sped up by directly manipulating the program counter. Use of internal registers by user programs. Recalling and storing the flags register. Renumbering registers. This allowed programs to manufacture local variables that weren't supported under "normal" HP-41C programming techniques. See below for links to synthetic and non-synthetic programming. 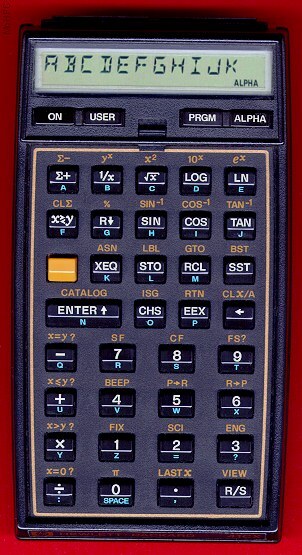 Some calculators introduced after the HP-41 had additional features. 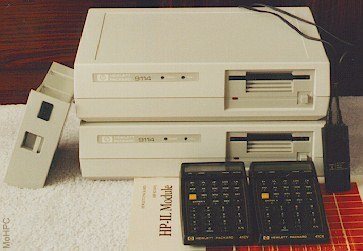 For example, the HP-15C had matrix math and the HP-16C had computer scientist features. 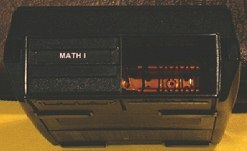 To keep the HP-41 clearly at the top-of-the-line, HP released the Advantage Module which added improved mathematical functions including matrix support, computer science functions (bases, conversions etc. ), and financial functions. Ability to list the directory of files in extended memory. Saving and reading programs or subroutines to/from files. Saving or reading blocks of registers to/from files. Operations on ASCII files and the ALPHA register. Operations to move files between extended memory and HP-IL mass storage devices such as the cassette tape drive. A programmable size operation. This allowed programs to assure that they had enough registers without requiring the user to set the SIZE appropriately. A programmable assign operation allowed programs to assign keys. Register move and swap functions allowed moving or swapping large blocks of registers efficiently. New flag functions made it easy for a program to save the state of the flags before running and restore them when exiting. Several ALPHA functions including string length, searching, shifting and rotating. Copying files and entire media. HP-IL control functions including loop configuration, device control and data transfer. 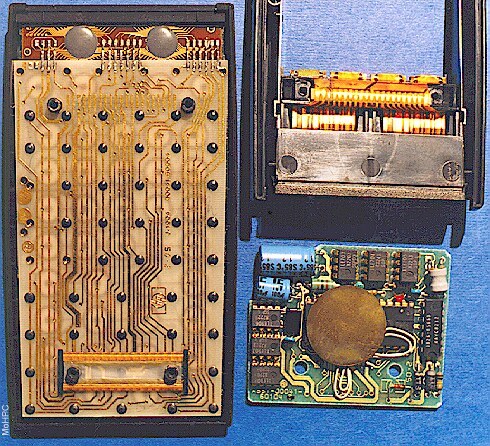 The HP-41CV was the same as the HP-41C except that it had four memory modules built in for a total of 319 registers. (With the four ports still available to add other modules.) 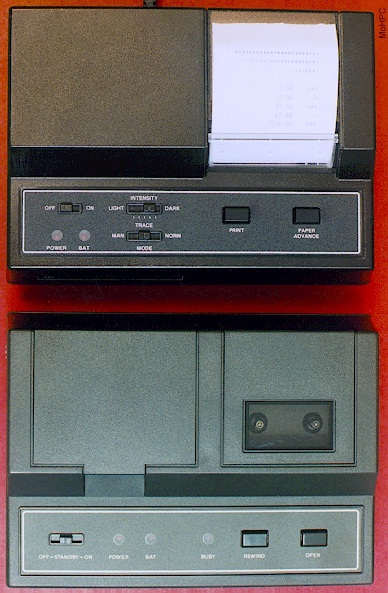 The HP-41CX was the same as the HP-41CV but added the Time module (stopwatch plus clock with alarms), an Extended Functions / Extended Memory module, a text editor, and some additional functions. The Option 001 version of the HP-41C had no labels on the upper rows of keys or on the surrounding keypad. This version was meant to be heavily customized by the buyer. Richard Nelson orchestrated the production of the PPC ROM which included a huge number of routines. Features included more math functions, integration, curve fitting, complex math, date functions, I/O routines, block data functions and synthetic programming aids. The phonebook-sized manual dwarfed the calculator, let alone the tiny ROM. Other modules for the HP-41C included the CCD module, HEPAX module, ZENROM module, and many specialized modules such as the C-9B P-S APAC Weight and Balance module (aircraft balance) and OB CALC SYS ROM created by GE for use with ultrasound devices in obstetrics. "You have just completed the HP-41C Owners Handbook and Programming Guide. You have certainly noticed that programming the HP-41C is simple, and even fun. Yet the capability of the system is astounding. Your programming expertise will increase as you continue to use your HP-41C. And you will find it an easy matter to completely customize your HP-41C." If you're desperate for an HP-41C and a don't need pocketability, consider this simulation for Microsoft Windows.